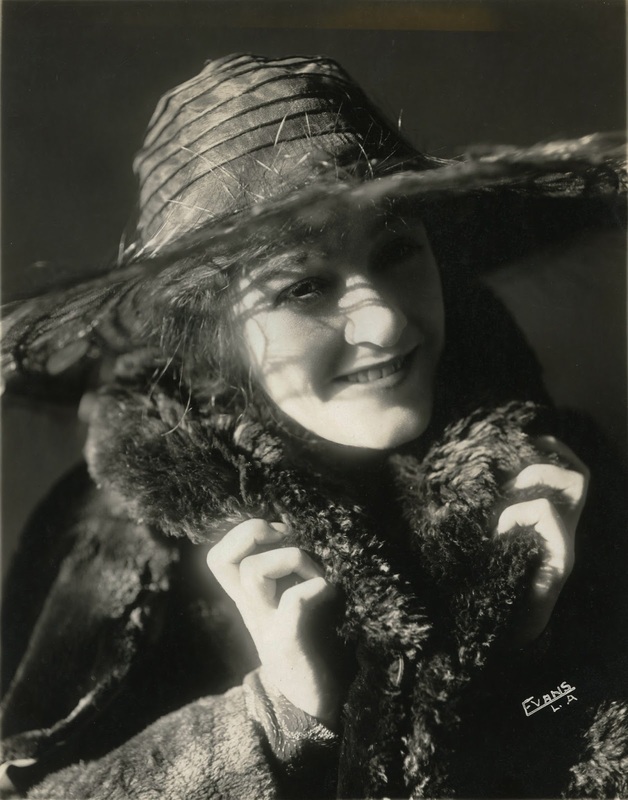 A blog to share information about early Hollywood photographer Nelson Evans. Although most of my research centers around Nelson Evans, I've spent a fair amount of time over the last year or so piecing together the story of his sister Claire. At some point, I will do a more thorough piece on Claire, but for this article I want to tell of one of the more interesting finds that I have uncovered. First a brief bio. 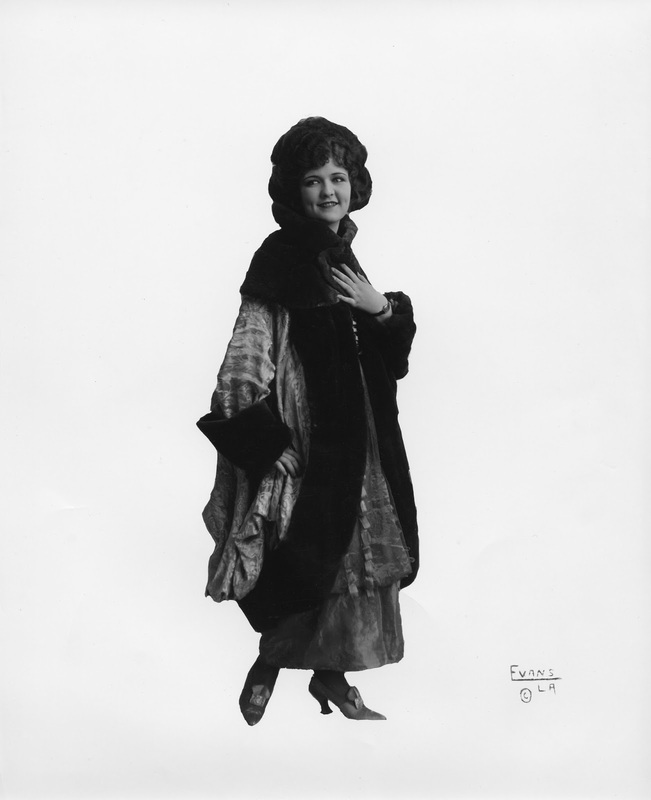 Claire Evans was born in Toledo, Ohio in 1885, the second of the three children of Charles and Mary Evans. Shortly after Claire was born, the family moved to Columbus. In 1904, she married for the first time, divorcing her husband in 1909. A few weeks after the divorce was finalized, she married again. This marriage was a bit more successful, not ending until sometime in the mid-20s. 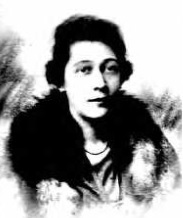 She married her third and final husband, Olympic medalist and real estate developer James Donahue, in 1929 (although not before settling a lawsuit filed by Donahue's ex-wife for alienation of affection). Claire and James remained together until March of 1966, when they both passed away, James just one week after Claire. Although only a single paragraph, there was a great deal of information for me to unpack. Oddly, the first thing that struck me was: yet another Evans lawsuit! Of course, the next thing was to start researching what I could. 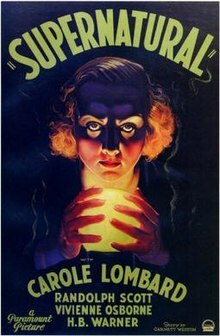 I began by looking at the film in question, Supernatural, with which I surprisingly unfamiliar. Supernatural, which was released almost exactly a year before Claire's lawsuit, stars Carol Lombard and Randolph Scott. Although the details of Lombard's dislike of the film and it's director, Victor Halperin, are minor legend, I want to talk more about the plot of the film. Credited to Garnett Weston, who wrote Halperin's more famous White Zombie, Supernatural's plot concerns Roma (Lombard) a young woman whose brother has recently died. When a fake medium claims that her late brother has a message for her from beyond, Roma agrees to attend a seance. During the seance, she becomes possessed by the spirit of a just-executed murderess, who happens to have once been the lover of the phony medium. Several things about the story jumped out at me. First, it seemed to me much too lurid to have come from Claire. However, there was something familiar about part of it. 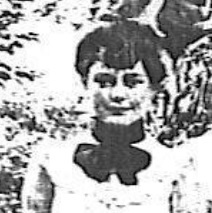 Like Roma, Claire had a brother who had recently died, at least in relation to her initial submission in 1924. And the Evans family did try to contact Nelson during a seance shortly after his death. 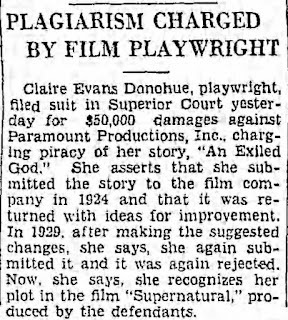 Also, the title of her story, "An Exiled God", suggests that it may have dealt with possession. 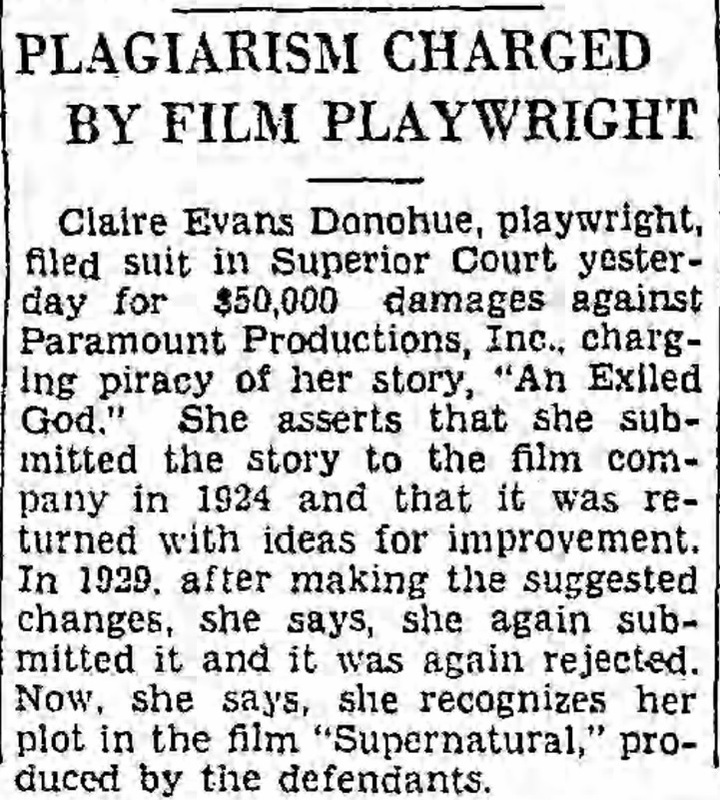 Another aspect of the newspaper piece that raised questions was the claim that Claire was a playwright. Several searches uncovered exactly nothing. So, why did she claim to be a writer? Well, as chance would have it, as it often has during my Evans research, the answer came when I wasn't looking for it. A few months after I began looking into the matter, someone contacted me about a collection of Claire's writing they had in their possession. I've only seen a few photographs of some of the collection, but it does mostly consist of film treatments. Remember when I said that I initially thought that there was no way Claire could have been responsible for a story as lurid as that of Supernatural? Well, among the titles of the her treatments that survive are "The Bunko Racket" and "The Twin Stilettos", the latter of which I have partially read. Lurid would be an apt description of what I read. So, was Supernatural really based on Claire's story? And was her lawsuit successful? We may never know. While part of the film's plot does seem to parallel Claire's own life, we don't know if that was also part of "The Exiled God". As for the lawsuit, I would not be surprised if Paramount settled even if they felt there was no merit to her claim. The Donahues were wealthy, even during the height of the Depression, and could afford to push the studio into settling out of court. Maybe some day I will have an opportunity to examine Claire's writing more closely and perhaps find the answers there. Somehow I managed to not write a single blog post in 2017, but that doesn't mean that the year was short on Evans related stories. Quite the contrary! Hopefully I will be able to find the time to catch up on all of the things that have happened since my last post. One of last year's biggest surprises (at least for me) was the placement of a new historic marker near the site of the Evans family home here in Columbus. The marker does a nice job of summing up the Evans' story in the neighborhood as well as their move to Hollywood. I had been hoping that such a marker might be put up, so it was a surprise when the Clintonville Historical Society contacted me about it actually happening. Although I was asked if there were any changes or additions I wanted to make, my only contribution was about a half of the sentence about Nelson's photography work. The rest of the text was written by the society's president, Mary Rodgers. Here's a photo of the marker. For anyone who is in Columbus, the marker can be found on the north side of East North Broadway, between Indianola and the railroad underpass. In the following months, I hope to post several pieces about the Evans family, who have been the main focus of my research over the last year. After that, perhaps some major news to report. Stay tuned! On August 15th, 1929, a fire broke out at the Evans Studio. Fortunately, the fire was extinguished before it did much damage. There was an estimated loss of $25,000 in draperies and antiques, but the building was in good enough shape to host a talk by Dr Jogesh Misrow in late September. The short report in the Los Angeles Times also mentions that the fire was put out before it could threaten the Mar-Cal Theater, which it claimed adjoined the studio. 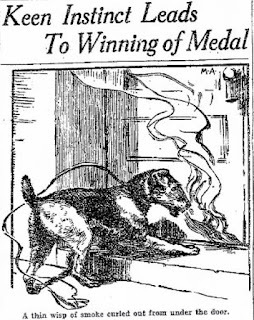 However, what it didn't mention was the role of Kentucky Boy, the dog that saved the studio. The basic story of Kentucky Boy's heroic deed is pretty straightforward. On that fateful night, the 7 year old Airedale was out for a long walk with his owner, Robert Byrne. While heading down Hollywood Blvd, Kentucky Boy broke loose, running for the Evans Studio. When Byrne finally caught up, he found the dog scratching at a side door, smoke pouring out. He raised the alarm and the fire was quickly put out. 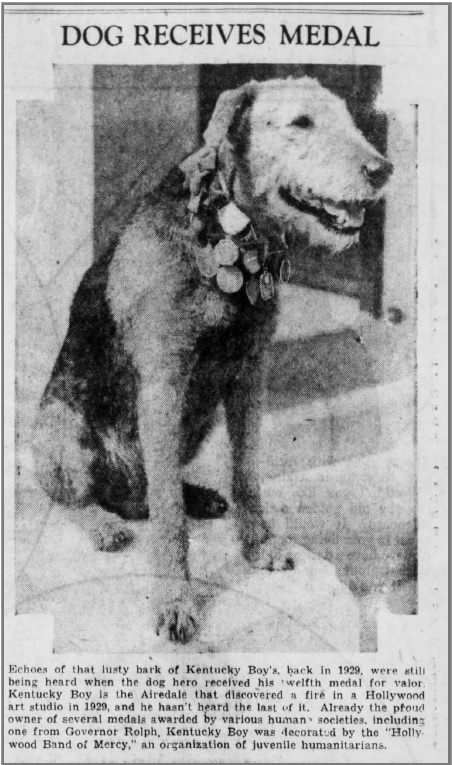 For his actions, Kentucky Boy was awarded a medal by the State Humane Society. Very quickly, his fame grew, as did the story of his heroic efforts. 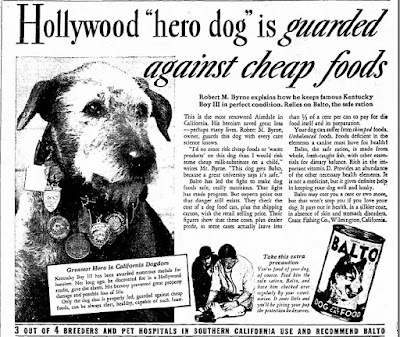 Word spread of his medal, inspiring local humane societies and other groups to honor the dog. Over the next several years, Kentucky Boy amassed 19 such medals, including ones bestowed by the mayor of Los Angeles and the governor of California. Stories about his honors and exploits were printed around the country. 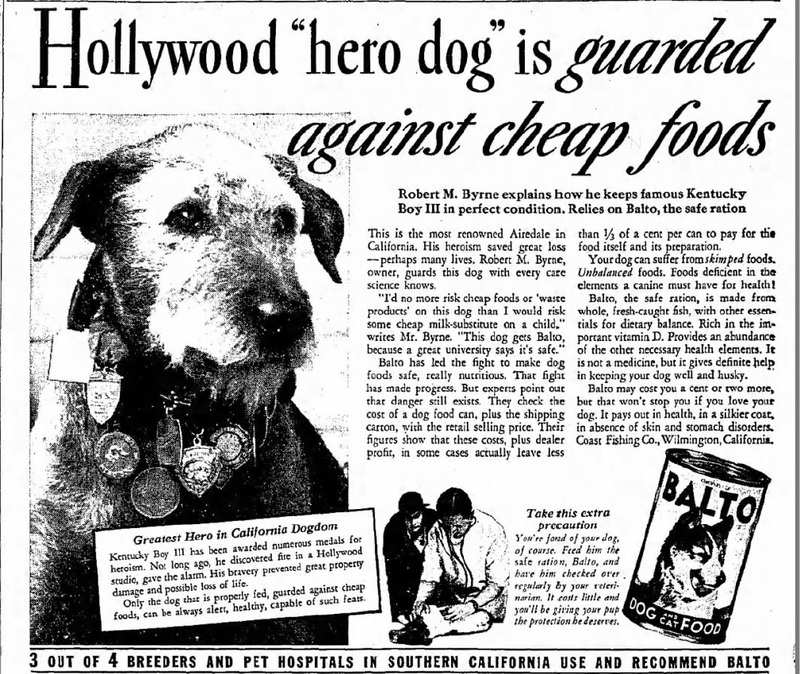 He even appeared in ads for dog food. Interestingly, the story of the fire was often changed and embellished whenever it was retold. In fact, the only article that I found that mentions the Evans Studio was from a couple of months after the fire. After that, it was at best implied that the building that was saved was a film studio, often it was explicitly called a Hollywood motion picture studio. In some accounts, fire was bellowing from the building by the time Kentucky Boy arrived, and studio employees were running around in a panic! Other accounts moved the studio to "Poverty Row" (i.e. nearby Gower St.), again implying that it was a movie studio. 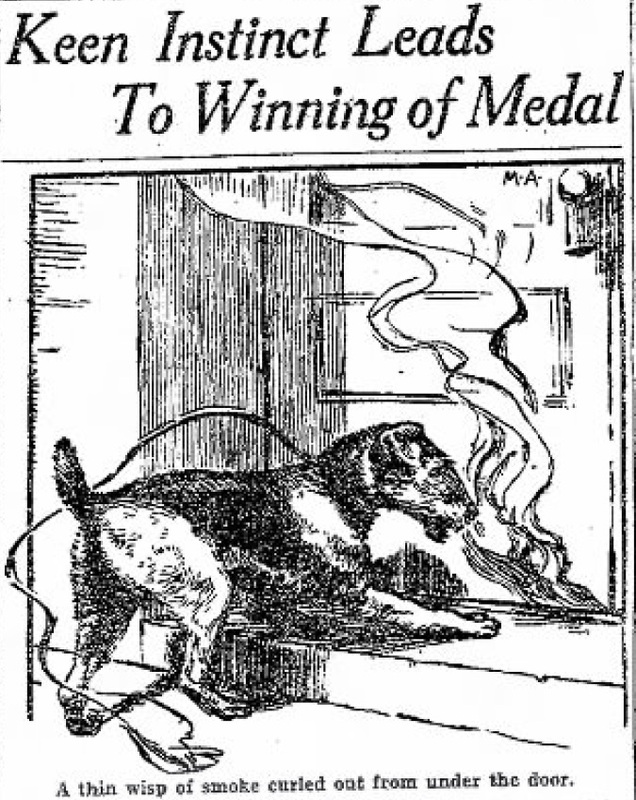 Of course, simply saving a building would not be enough to warrant giving a dog 19 medals. He was also credited with saving the lives of nearly 300 people who were watching a film in the Mar-Cal Theater. As mentioned earlier, the initial report of the fire said that the studio adjoined the theater, suggesting that if the fire had not been noticed, the theater would have also been set ablaze. However, there's one small problem with that story. The studio was not next to the theater. Between the 2 buildings was the former Mabel Condon Exchange, as well as 2 driveways. None of the 3 buildings were physically connected, so for the theater to have caught fire, the flames would have had to have jumped over the 2 driveways. Possible, of course, but one would think that by the time the second building would have been engulfed, the theater would have already been evacuated. 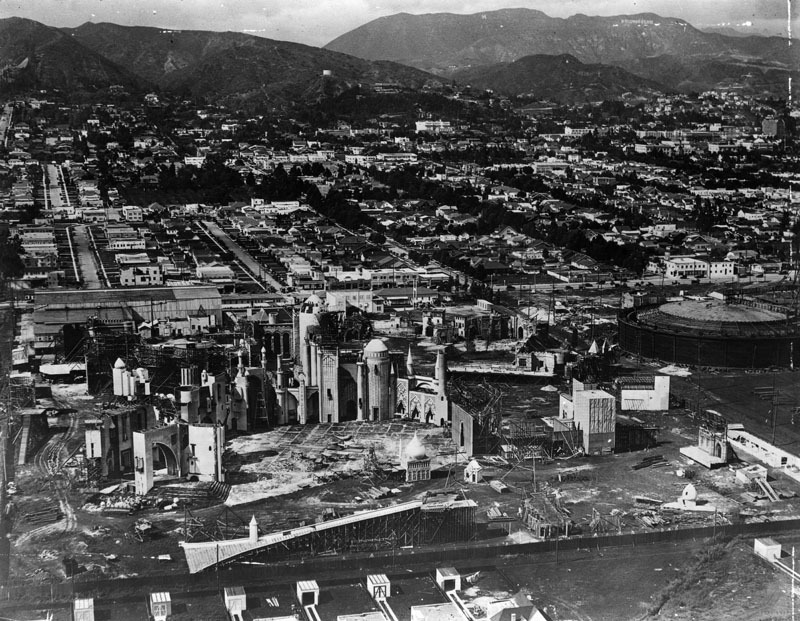 The Evans Studio is the white building on the left and the Mar-Cal Theater is the large building on the right. Tall tales or not, Kentucky Boy's fame lasted until his death in 1937. A memorial service was held in Lafayette Park where several dignitaries, including actor Hobart Bosworth, gave eulogies. Sadly, 2 years after Kentucky Boy's death, his owner Robert Byrne was murdered in his home. So far, I have not found any indication that the crime was ever solved, although at least 2 people were arrested. Cinevent 49 took place over the Memorial Day weekend in downtown Columbus. One of the last remaining movie conventions, it is one of my most anticipated events of the year. Not only to I get to see many great obscure movies, there is also a large dealers room full of a variety of movie memorabilia. Usually, I can find a few Evans items, but this year was above average and included a few surprises. Arcade cards are the most common item I tend to find, but this year I only came away with 3 new ones. It's always nice to find another early photo of Colleen Moore and Earle Williams looks quite dapper. 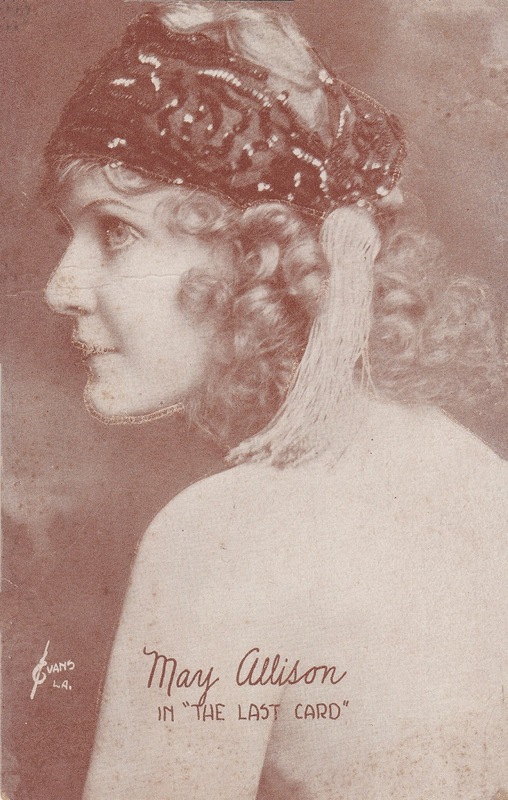 The May Allison card shows some odd retouching, but I do have an 8x10 of this same photo. I also got another photo of Ms. Allison at the convention. And it turns out that I had purchased another portrait of her by Evans without initially realizing it. I found a copy of the December 1919 issue of Motion Picture Classic magazine. Inside were 2 articles illustrated with Evans photos, one about Alice Lake, another Betty Compton (for which he has a byline). There are also a few advertisements that use his photos. However, it wasn't until after I purchased it that I read in the table of contents a note about the cover art. 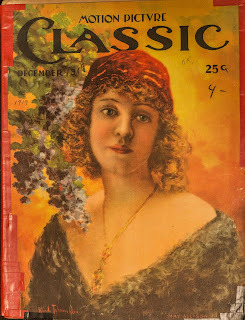 The cover is a painting of May Allison, based on a photograph by Evans. And by the look of it, one that was taking during the same photo session as the card above. Among a group of 5x7 fan photos that I found was this one of John Bowers. 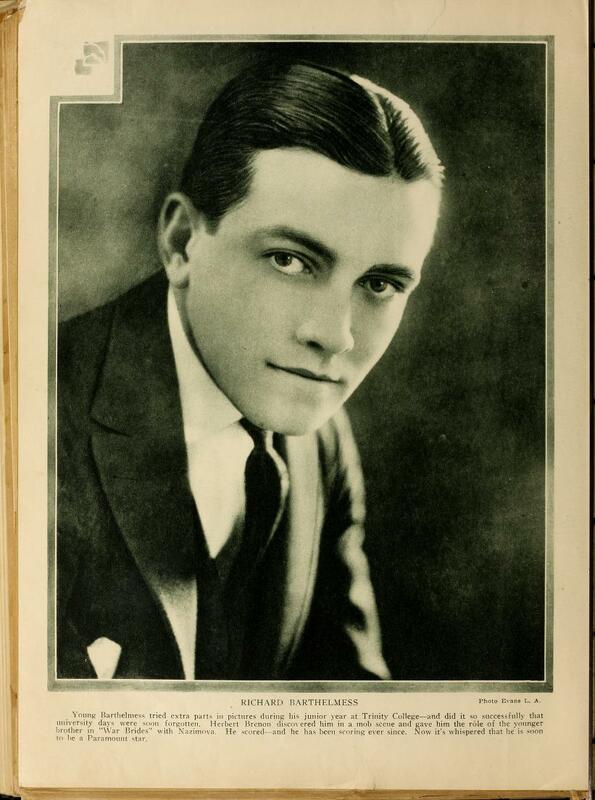 Bowers is probably best known for his 1936 suicide, which was supposedly an inspiration for the film 'A Star is Born'. Surprisingly, I only found 1 bathing beauty item that I did not already have, this nice double-weight photo of Vera Reynolds. 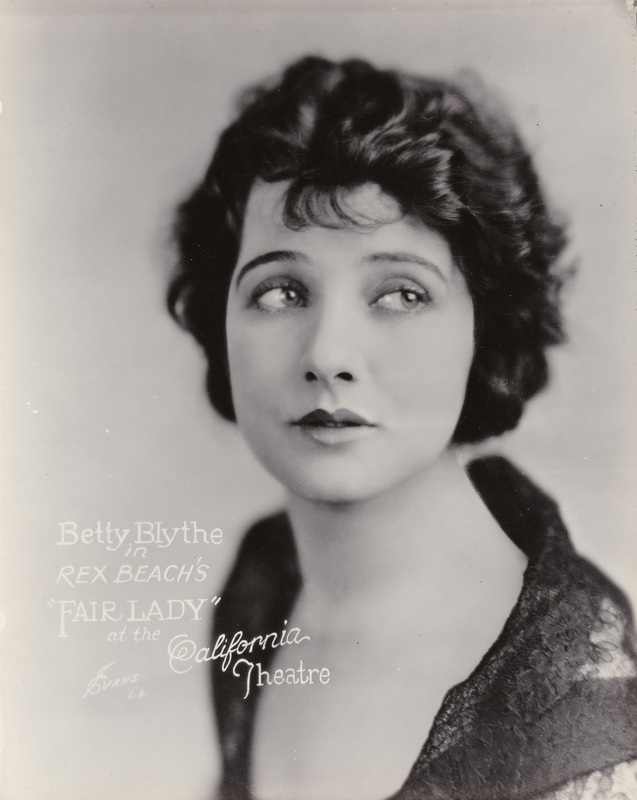 Finally, I came across this photo of Betty Blythe, a promotion for the California Theatre, which was in downtown Los Angeles. The theatre often used Evans photos in their promotions, although this is only the second one that I've purchased. Along with these Evans items, I also bought a number of DVDs and Blurays. None of them were of silents, so I didn't expect anything Evans related on them. But I was wrong. Arguably the least likely to have any Evans references was a set of the British television series 'The Mind of J.G. Reeder.' Based upon stories written by Edgar Wallace, which are great reads, I had been wanting to see the series for some time and was delighted to be able to finally get my hands on it. Shortly after getting back home from the convention, I popped the first disc of the set into the dvd player. Set in the 20s, the series has that cliched 'feathers-and-art-deco' look that in the late 60s/early 70s passed for the era in question. However, one set representing the lodgings of a couple of ex-cons, the usual flashiness wouldn't have been appropriate, so the timeframe was defined by covering the walls with photos of various actresses, presumably cut from fan magazines. There were a few bathing beauty type photos, although it was difficult to tell if any were by Evans. 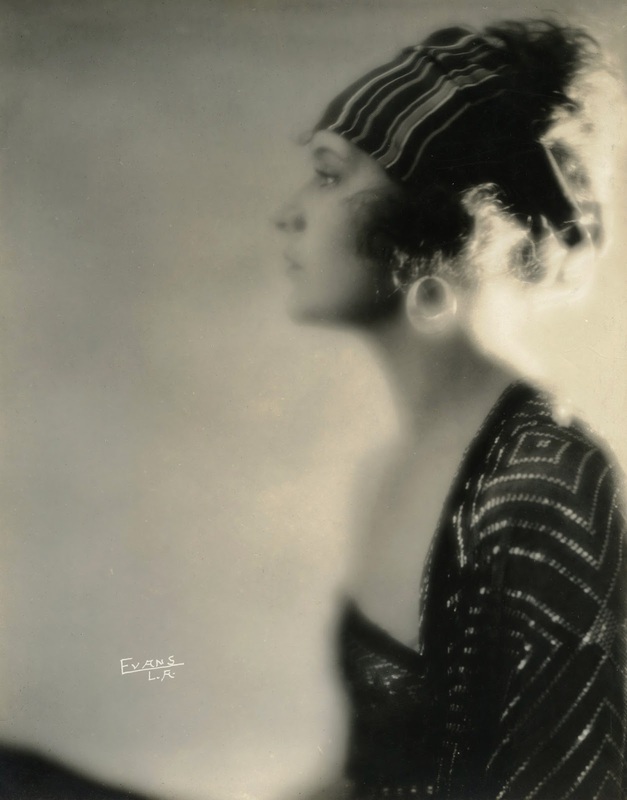 But there was one large and very prominent photo of Gloria Swanson that was definitely taken by Evans. Very unexpected! Apparently popular among fictional British criminals. 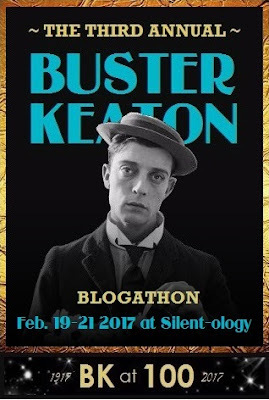 This is my contribution to the Third Annual Buster Keaton Blogathon, hosted by the excellent Silent-ology blog. 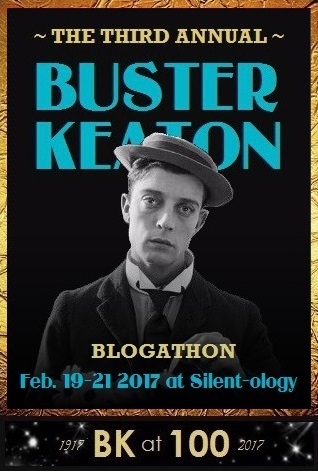 This year's blogathon is a celebration of the 100th anniversary of start of Keaton's film career. So far in my research I have only come across one Evans photo of Buster. 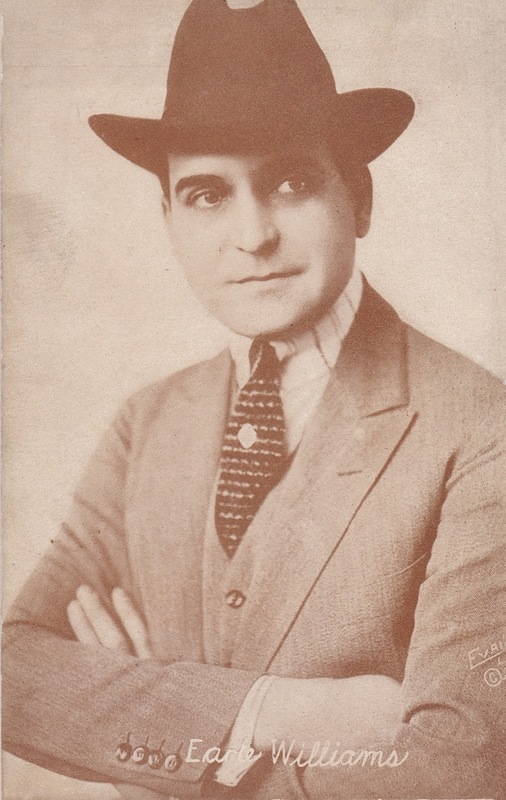 It most likely was taken around the time he started his solo career in 1920. 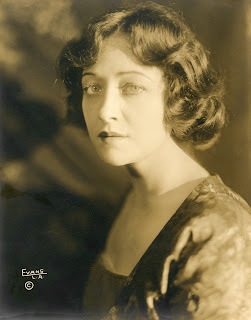 Evans may have only photographed Keaton on this one occasion, but he did create portraits of some of Buster's leading ladies, both on and off the screen. 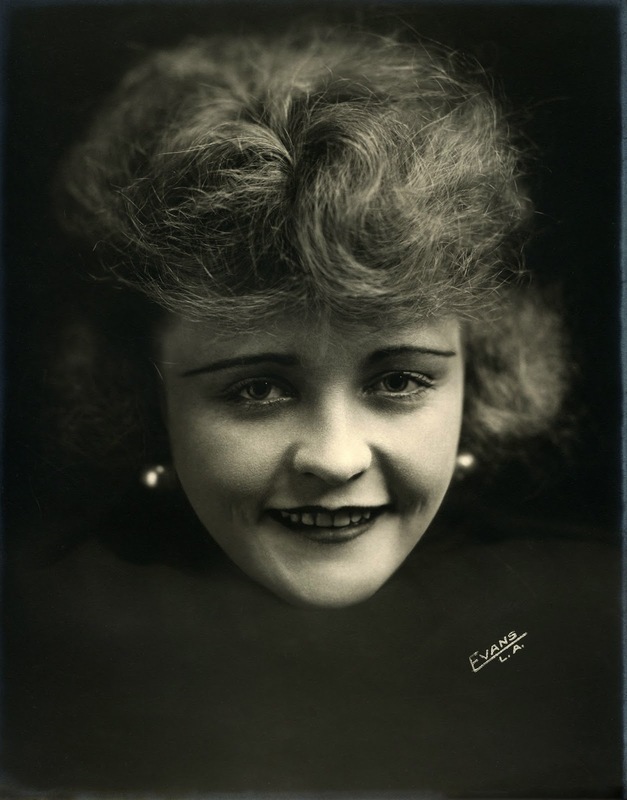 Probably the earliest of these portraits is this one of Phyllis Haver. Phyllis appeared along side Buster in The Balloonatic (1923). 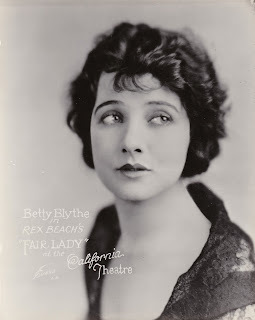 Of course, a few years earlier she gained fame as one of Mack Sennett's bathing beauties and was photographed many times by Evans at the time. 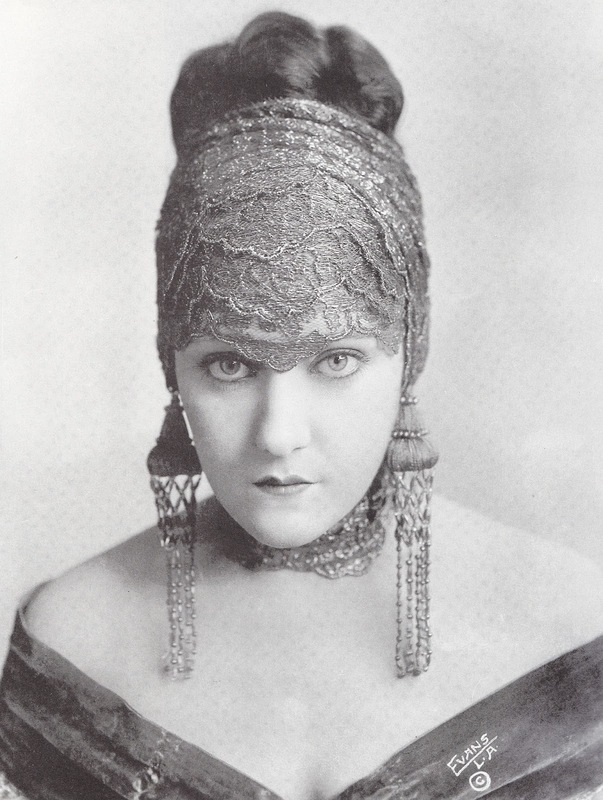 This particular photo seems to be from very early in her career, probably at the beginning of 1917. Alice Lake was the lead actress in several of the excellent films Buster made with Roscoe Arbuckle at the beginning of his career. This is one of my favorite Evans photos, very modern but taken before 1920. Arguably the most popular of Buster's leading ladies is Sybil Seely. Like Phyllis (and another Buster co-star, Virginia Fox), Sybil spent some time with Sennett as a bathing beauty. Her tour of duty came after Evans had left the studio, but he did at least one portrait session with her. 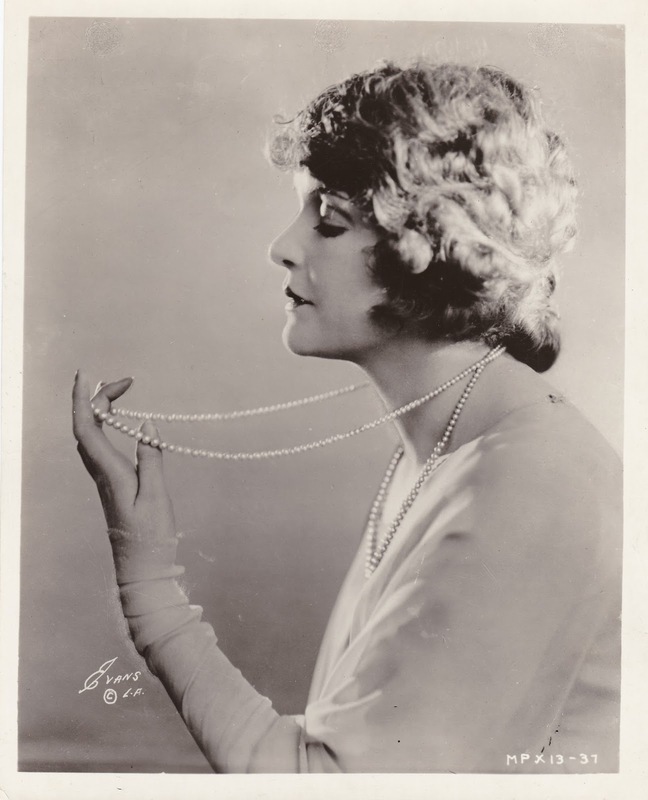 One of Keaton's first leading ladies off the screen was actress Viola Dana. Alas, the romance didn't last very long. Evans photographed Viola (as well as her sister Shirley Mason) many times. 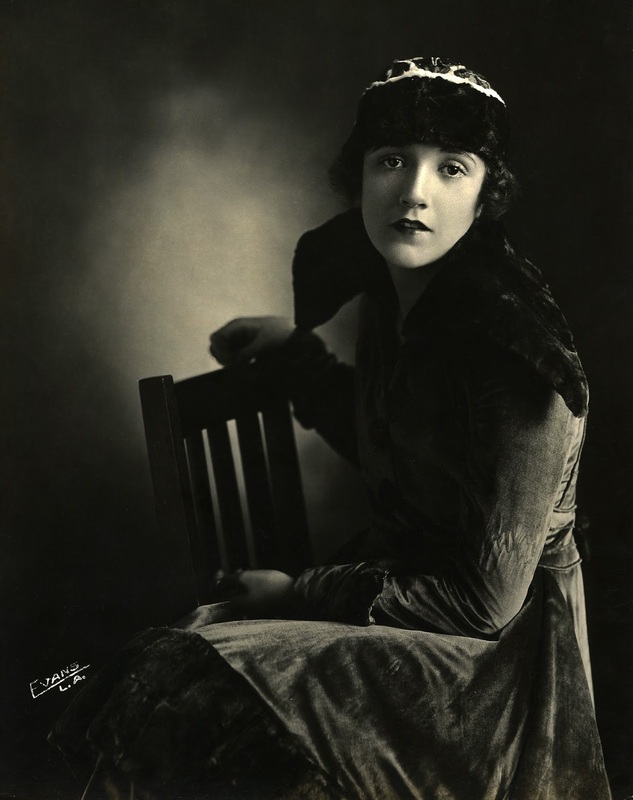 Evans doesn't appear to have done any portraits of Keaton's first wife, Natalie Talmadge, but he did photograph her more famous sister, Constance. Normally I would apologize for pulling a switch like this, but considering the low opinion many Keaton fans have of Natalie, perhaps it is for the best! BTW, another favorite photo of mine. Whenever I visit Hollywood, one of the places I almost always make an effort to see is the street that the Evans family lived from about 1918 to 1940. Granted, their home is long gone (as are all of the homes of their neighbors), but they managed to leave their mark on the landscape. 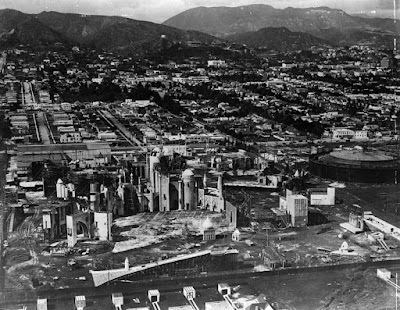 The area of west Hollywood south of Sunset Blvd was mostly citrus groves in 1918, when Charlie Chaplin built his studio there, just along Le Brea Ave. Most buyers in this quickly developing neighborhood purchased small home lots. But the Evans family was thinking more on the scale of Chaplin, buying a parcel of land 2 blocks west that was slightly larger than the comedian's studio. The Evans home in Hollywood is unique. Though situated in the heart of the city, it is so secluded that those unfamiliar with its location would pass it by entirely. A blind street leads to the gate, and a fence is built around the entire acreage. A large orange grove extends through two streets. The family house is a place of three stories, quaint and of great beauty. Sometime after Nelson passed away, the east and west sides of the property were sold off, with the rest going after 1936. At some point after Nelson's mother died in 1940, nearly, the entire street had been redeveloped and is now mostly apartment buildings. However, the footprint of the estate can still be seen. The 'blind street' mentioned above is Alta Vista. At the time, it essentially served as the Evans' driveway. Most of the streets in the neighborhood were originally wide lanes that gave access to the groves. As the area was developed, the lanes were narrowed as they were turned into streets. Except Alta Vista, up to the entrance to the Evans property. Contemporary aerial photos show that there were 3 palm trees down the middle of the street, and then the street ends with a wide turn-around. 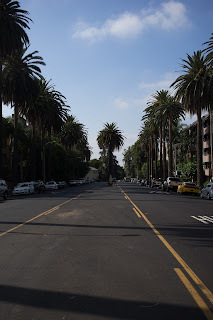 Today, the 3 palm trees are still there and the turn-around marks the spot where the street now narrows, jogs a bit to the west and then continues through what was once the estate. Here's an aerial view of the area. 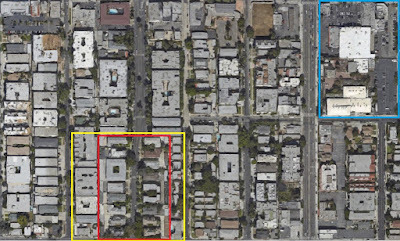 The yellow box outlines the original footprint of the estate and the red box is a rough approximation of the property in 1930. 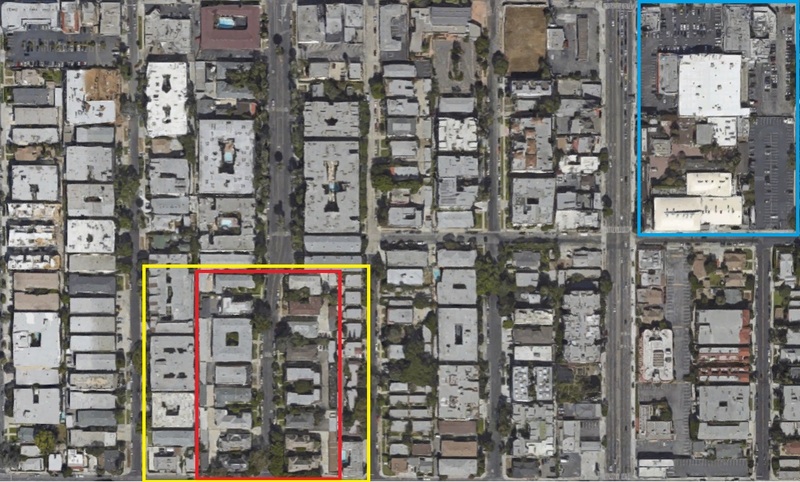 The blue box shows the area of the Chaplin Studio. Another studio that was close by was the Pickford-Fairbanks Studio. Built around 1918 as the Hampton Studio, Doug and Mary took it over in 1922. Many of Fairbanks most famous films were shot there. Here's a photo of the studio at the time of the filming of The Thief of Bagdad; the Evans property can be seen just a block north. The large stand of trees just to the north of the studio is the Evans estate. One of the more interesting facets of the Evans story is the signature that appeared on his (and his studio's) portraits. While 2 particular signatures are most common, there are a few variations that are worth looking at. Note that my research into the signatures is still very much ongoing and what follows contains a bit of conjecture on my part. 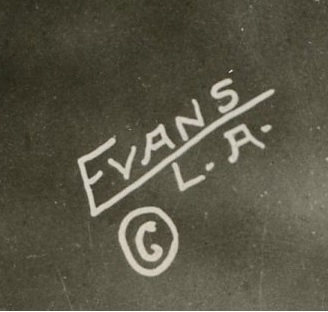 This is the original Evans signature and lasted until sometime in the middle of 1920. Unlike that of many other Hollywood photographers of the time, it is simple, yet distinct. The signature also appears on portraits taken as early as 1914, although not added until Evans established his studio and could better exploit them. 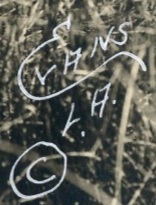 In mid-1920, Evans changed his signature to this slightly fancier version. The E is very similar to Evans' actual signature, but much more neatly written. At the beginning of 1922, Evans married Rosalie Knight and spent the next 6 months on a honeymoon trip to the continent. Of course, during this time the studio continued with business as usual. To indicate that the portraits taken at this time were done by other photographers, an Evans Studio signature was used. It's possible it was also used briefly after his death. After Nelson's death, the official studio logo was used on photographs. It may have also been used on prints of earlier photos that were sold by the studio during this period. Sometime in the mid 20s, the studio changed its name to Nelson Evans Studio. By this time, the studio clientele included fewer and fewer actors, so this signature is fairly rare. It, too, may have been added to earlier photos. I've come across 2 signatures that I still can't quite fit into the picture (excuse the pun). This one I've only seen twice, both on portraits of Viola Dana. However, I've also seen one of the photos with his regular signature. 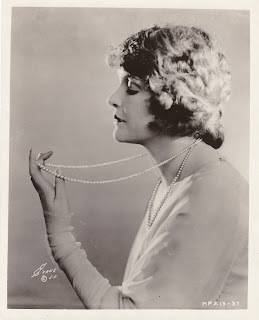 The photo was published early in 1922, so it could be a replacement signature as Evans was away on his honeymoon. This one is a true mystery. I've seen it appear on photos that I've also seen with one of his other signatures. It's possible that this is the signature that was used while he was serving in the military in 1918. Or it could be another post-1922 signature, used exclusively on earlier photographs. Note that the E is very similar in style to the signature of George Cannons. 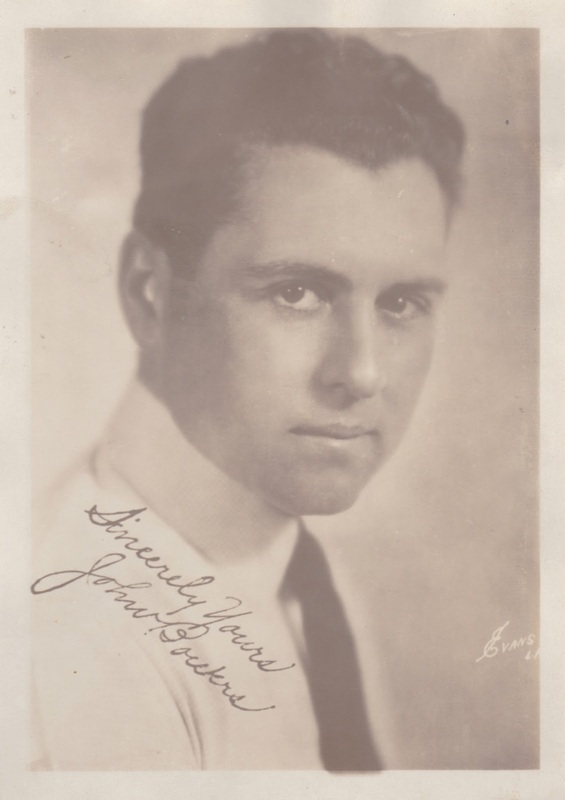 Cannons was a British photographer who came to Los Angeles around 1924 and worked for Mack Sennett. There's no evidence that he ever worked for the Evans Studio, so we may never know why the signatures are similar. Perhaps it is just coincidence. As I had said earlier, this is a work in progress. I am still looking for a signature that would fit into Nelson's brief time in the military between late 1918 and early 1919. Expectation is that it would be similar to the one used during his honeymoon. I am also looking into the signatures of another photographer in hopes of proving that Evans did an apprenticeship before opening his own studio. Hopefully, I will find enough positive evidence that I can share something soon. My research into the life of Nelson Evans occasionally goes in odd directions, but none quite so surprising as the turn it recently took. Part of my Memorial Day weekend was spent at a reunion of my dad's family. As seems to be typical of reunions, some of the family brought along photo albums. One of these albums contained genealogical research one of my cousins had done. Now, I've done my own share of such research into my family, so I was a bit surprised when I saw among my cousin's research the surname of Hysel. As told in one of my earlier posts about his marriage history, in 1909 Nelson had eloped with Helen Hysell to Michigan. Since both were living apart by the end of the year, it appears that the marriage ended in annulment, if not divorce. I knew that Helen's family was originally from the southeastern part of Ohio, not terribly far from the area my own family resided at the time. However, I didn't recall anyone by the name of Hysell or Hysel in my family tree. That bit of mystery was solved on another page of my cousin's research: there I saw the name spelled as Hisle, which was familiar to me. But could it be the same family? When I was back home the next day, I started to investigate. Fortunately, I had already traced the Hysell and Hisle families back to the late 1700s. Taking a closer look at the earliest ancestors in both lines, it quickly became clear that there was indeed a connection: both families were living in the same county at the same time, both came from the same town in Virginia, and both were using the Hisle spelling. However, I still needed to find the common ancestor. Again, that proved a bit easier than I was expecting, helped by the fact that my great-great-great-great grandfather's name was Nimrod. Going by birth dates, it seemed possible that he was the brother of the earliest ancestor I had found in Helen's family tree. And it turns out that I was correct: the common ancestor was Leonard Hisle, my great-great-great-great-great grandfather and Helen's great-great-great grandfather. I don't think this discovery changes my approach to my research into Nelson's life, but it certainly makes me more curious about Helen, someone I already found interesting. Knowing that she is a (very) distant relative seems like reason enough to start finding out more about her, too. On this Memorial Day, it seems appropriate to pay tribute to the members of Nelson Evans' family who lost their lives in the service of their country. Going back to the Revolutionary War, Nelson's great-great-great grandfather Jonathan Wadsworth was killed in the Battle of Saratoga on September 19, 1777. He had only been in the Army for a few months before his death. He was 48 years old. Nelson's grandfather, Ephraim Evans joined the Union army in 1862 as a member of Company D of the Ohio 125th Regiment. By 1864 he had reached the rank of Captain. However, on June 27th of that year he was wounded at the Battle of Kennesaw Mountain in Georgia. On July 8th, he died of his wounds. Charles Hopkins Evans, Nelson's older brother, was 18 when he joined Battery H of the First Battalion, Ohio Light Artillery (the same unit that his uncle Edwin Hopkins had been in during the Civil War) in 1898. serving in the Spanish American War. By 1900 he was Sgt. Evans of the 41st New York Regiment and in the Philippines. On March 12th, 1901, Charles was killed in battle. I Visit the Evans Studio. Sort of. On past trips to Los Angeles, I've visited the site of the Evans Studio, but for some reason never had a camera handy. So on my most recent trip, I made sure to have a camera on me. Unfortunately, the building was torn down long ago, probably in the late 30s or early 40s. 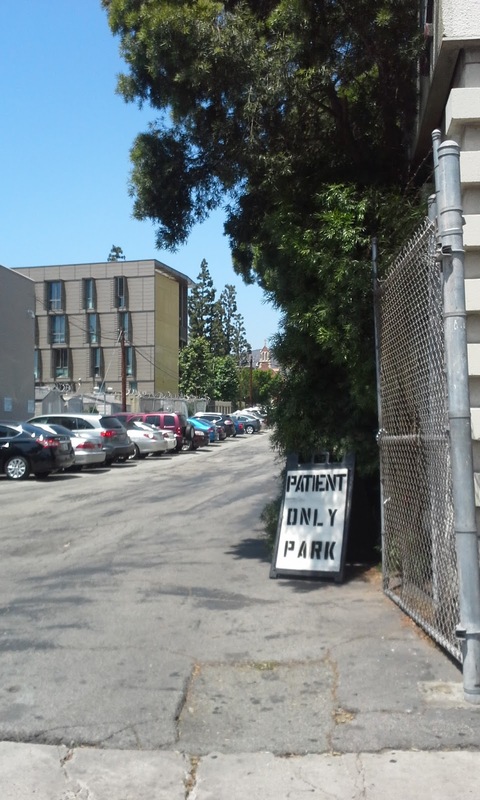 Now the site is the parking lot for a community health center. For those interested in finding the site, it is on the north side of Hollywood Blvd, just east of the intersection with Gower. 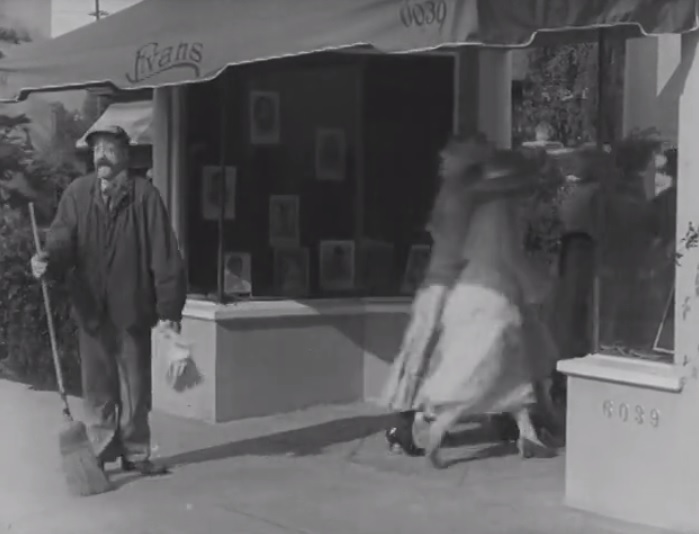 One of the things I enjoy about watching silent comedies is seeing Los Angeles as it was 100 years ago. Whether it is foot chases through Chinatown or a car racing down Hollywood Boulevard, the opportunity to see sights long gone I find incredibly fascinating. So you can imagine how excited I was to find out that the Evans Studio made an appearance in the 1918 Harold Lloyd 1-reel short Look Pleasant, Please. Lloyd appears as his glasses character in the ten minute film. 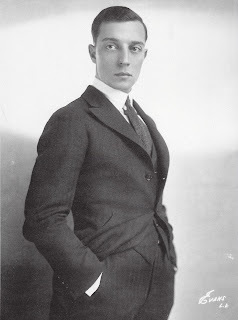 The plot involves a flirting photographer (William Gillespie) who makes a move on client Bebe Daniels. Bebe's response is to call her husband, who immediately heads off to the photographer's studio in a jealous rage. Meanwhile in a nearby store, grocery clerk Harold is being chased by a group of cops after trying to cheat a customer. His flight, no surprise, takes him to the photography studio, where the very frightened photographer offers him the opportunity to take his place, in hopes that Bebe's jealous husband takes out his anger on the wrong man. 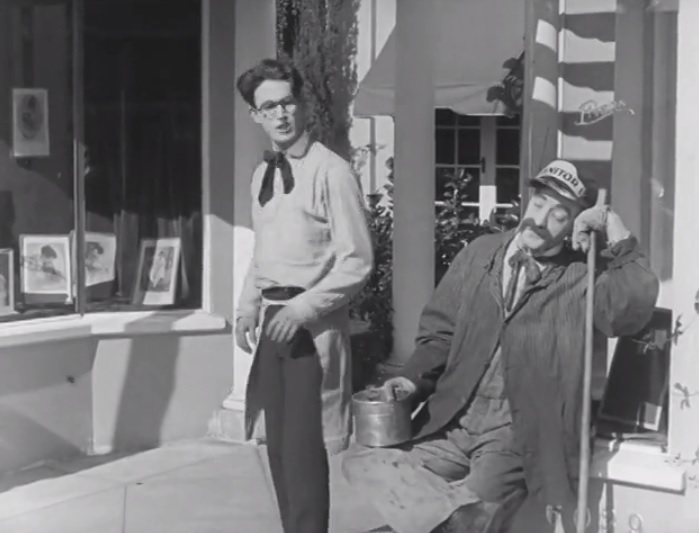 At this point in the film, the action get chaotic (or should that be more chaotic), as Harold tries his hand behind the camera, with the expected slapstick results, and the husband shows up ready to kill. While the interiors were sets, the exteriors of the studio were shot at the entrance to the Evans Studio. Interestingly, no effort was made to hide the name of the studio, with the Evans logo clearly seen on windows and awnings. Snub stands by as a group of women head into the studio. Probably not an uncommon sight! When I first heard about this film, I was curious to see if the photographer might have been modeled after Evans. Although one could imagine that someone who was becoming known for his photographs of young ladies in bathing suits might get a reputation for flirtatious behavior, it's more than likely that the plot of the film was already set before the location was chosen. It's also likely that Evans offered the use of his studio for the chance at some free publicity for the barely year-old business. One bit of irony: Evans seems to have never photographed Harold Lloyd. In doing my research on Nelson Evans, I've gained an appreciation for photographs of the first quarter of the 20th century. Although the silver gelatin process was in common use for black and white pictures up until 50 years ago, those from a century back have a quality that is missing from later examples. Quite simply, they glow. While I have many examples in my collection, I've chosen this one of Louise Fazenda because, well, it's Louise Fazenda! I'm not sure how well it will show up here, but the lacing on her dress practically sparkles on the actual photo. How much control Evans had over this type of effect is difficult to say, but it is more pronounced in his earlier photos. BTW, notice the window on the left side of the photo. It appears to be cut from another photo and added here, probably covering up a blown-out section where the sunlight was coming in. A bit awkwardly done, but not bad for a hundred years ago. Before he became a photographer of movie stars, Nelson Evans' first venture in show business was as a film exchange man. 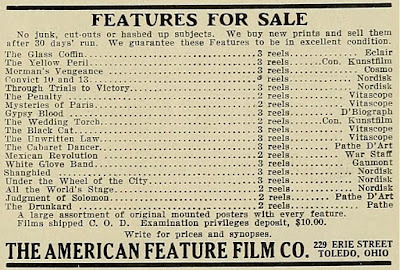 Beginning around 1903, film exchanges were the distributors of movies, acting as a middleman between film producers and exhibitors. An exchange would typically handle films from specific producers or, as in the case of Evan's business, specialize in a certain type of film. Despite naming his exchange The American Feature Film Company, Evans distributed only foreign films. Ads show that he was handling films from countries such as Germany, Italy, Spain, and Sweden. 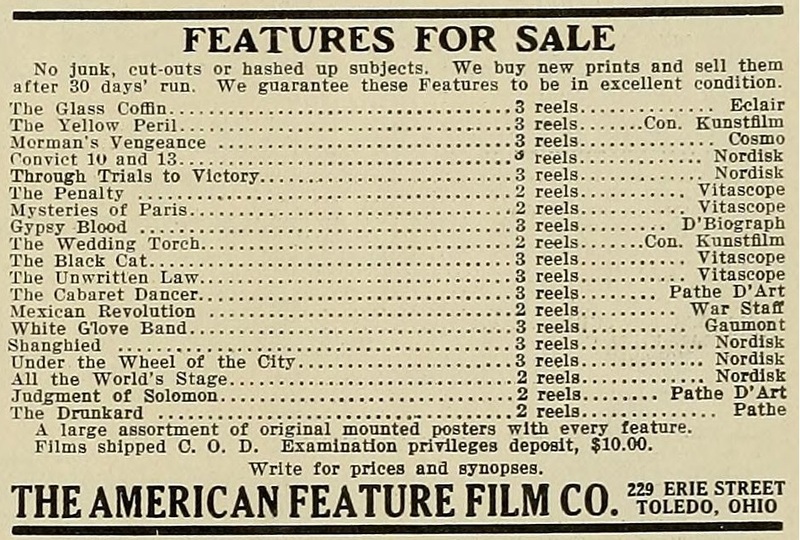 The first mention of The American Feature Film Company was in the October 5th 1912 issue of The Motion Picture World. In the "Doings at Los Angeles" column, Evans' mishandling of submitting a film to the local censor board is told. The board had made a special arrangement to view a film (The Yellow Peril from Germany) he was trying to rent to a local theater, but Evans was apparently unaware of the special meeting and failed to show up. The board did watch the film the next day at their regular meeting and passed it with a few cuts. The delay, however, cost Evans 3 days of business on the film. This incident probably took place sometime in the late summer of 1912, as the Evans family had moved to Toledo, Ohio by September of that year. It is unknown exactly when this first iteration of The American Feature Film Company began, but it does show that Evans' interest in the film business began during his first stay in Los Angeles. After a few months in Toledo, Evans restarted the business in January of 1913. From his base in northeast Ohio, Evans' territory covered not only Ohio, but Michigan, Indiana and Kentucky as well. To cover the southern part of this area, the company also had an office in Cincinnati. By early 1914, Evans appears to have sold the business, which continued as the Lake Erie Film Brokers, and began another film exchange in Cleveland. Evans partnered with two Cincinnati businessmen, I.W. McMahon and Jerome Jackson, as well as his partner in the American Feature Film Co., W. J. Findlay, and his father Charles, to create the Independent Feature Film Company. The company was formed with capital stock of $25,000 (very roughly around $500,000 in today's money). For whatever reason, the Independent Feature Film Company, or at least Evans' involvement, was short-lived. 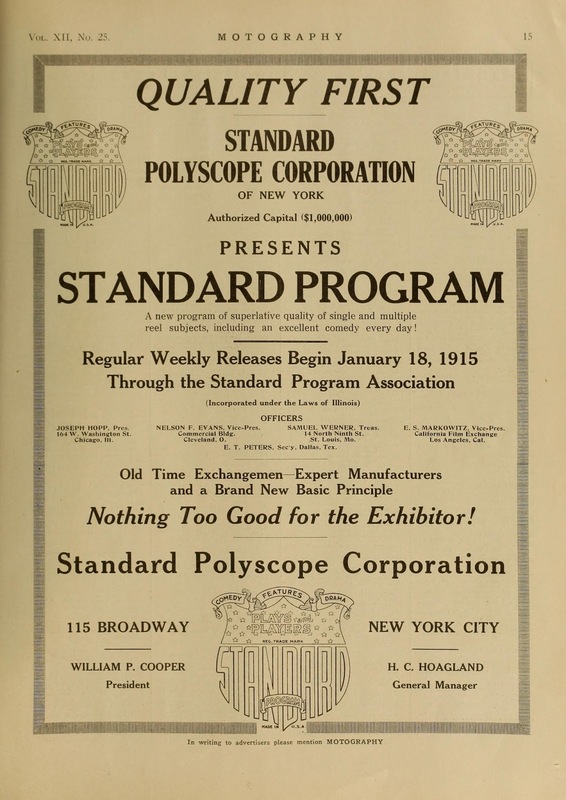 In the fall of 1914, several press releases and full-page ads announced the creation of the Standard Program Association, a conglomeration of several film exchanges, with the intention of distributing a standard package of films across the country. Evans was named as one of the vice presidents of the association, which is impressive for a 25 year old with less than 5 years experience in the business. 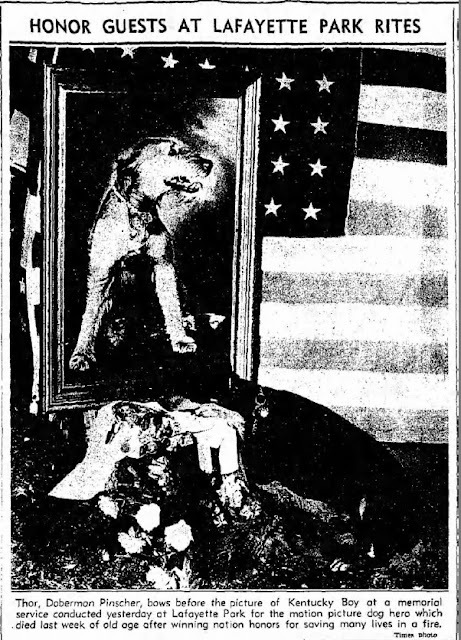 The Standard Program was set to begin in January of 1915, but according to some sources (not yet verified), Evans had already returned to Los Angeles and started his career as a photographer in the last months of 1914 (however, the ad below, from December 1914, still has him listed as a vice-president). 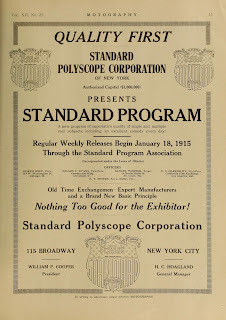 As for the Standard Program Association, it's ultimate fate is unknown, the last mention of it in trade magazines being in the very month it was to begin. Information is still sketchy concerning the end of Evans' career in the film exchange business and his subsequent return to Los Angeles. Did his business go under? Did he just tire of it? Were there health reasons? Perhaps the lure of a job in the film industry, which had begun it's exodus westward by this time, pulled him back. Like most of the questions that come up in my research, we will never be able to answer them. During his brief career, Nelson Evans photographed some of the biggest stars in Hollywood. Among them: Mary Pickford, Douglas Fairbanks, Rudolph Valentino, Buster Keaton, Roscoe Arbuckle, Lon Chaney, Wallace Reid, Gloria Swanson and Colleen Moore. But there were many more that apparently did not sit for an Evans portrait, so I decided to put together a list of those who I wished he had photographed (the list only includes actors who were active during Evans' career). It goes without saying that I have not seen every photo taken by Evans and so it is possible that some of the following actors did have a portrait taken by Evans. If I come across one or someone out there points me to one, I will edit the list accordingly. -Marion Davies With her beautiful eyes, Davies would have been the perfect subject for Evans. 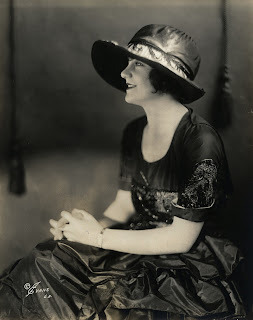 -Edna Purviance For whatever reason, there seems to be fewer portraits of Edna than would be expected, so maybe it's not too surprising that she never worked with Evans. -John Barrymore Evans didn't typically photograph men's profiles, but I would think he would have made an exception in this case. -Richard Barthelmess Perhaps not the most exciting subject for a portrait, but I wonder how Evans would approach the task. 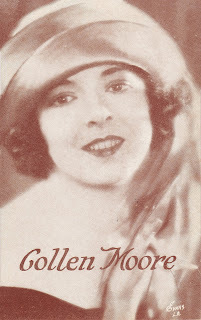 UPDATE: from the July 1919 issue of Motion Picture Magazine. -Jobyna Ralston Another seemingly ideal subject for Evans. -Harold Lloyd With or without glasses? -Stan Laurel & Oliver Hardy Even though they were still a few years away from becoming a team, I lump them together here for convenience sake. 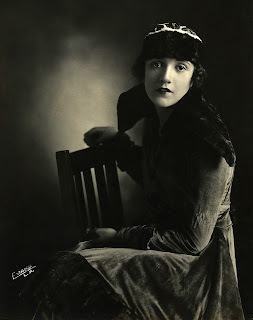 -Mabel Normand Okay, Evans took lots of photos of Mabel for her movie Mickey. But I have yet to come across an actual portrait of her by him. Mabel seems to have favored New York photographers over those in Los Angeles. There's a few famous names missing from my list. That's because there is some evidence that Evans did photograph these actors, but it's far from solid fact. -Charlie Chaplin I've seen an early photo of Chaplin with the Evans signature, but I came across another photo that appears to be from the same shoot that was attributed to Albert Witzel. While it's possible that Evans did an apprenticeship with Witzel, the date of the photo (1914) would put Evans out of the picture, so to speak, as he was back in Ohio at the time. But it is something I need to research further. -Lillian Gish One of my complaints about John Kobal's Evans-centric book Hollywood- The Years of Innocence is the lack of attribution to almost all of the photographs, except to say that most of the photos were by Evans. One of the photos in the book is a group shot of Gish along with her mother, sister Dorothy, Mary Pickford and Mildred Davis. 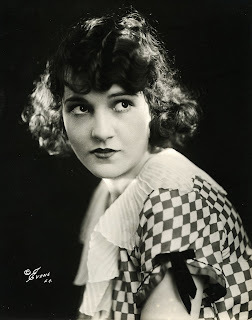 Evans photographed other Griffith actors, so it's possible that the photo is by him. The book also includes a still of the great Babylonian set from Griffith's Intolerance. Does that mean it was taken by Evans? Wish I knew! -Alla Nazimova Two Nazimova photos appear in Kobal's book, one explicitly credited to Evans, the other not. However, the uncredited one (outside the Garden of Alla) seems more likely to be an Evans than the one attributed to him! If anyone finds an Evans photo of any of the actors listed above, let me know. In the first two posts (here and here) about Nelson's marriage history, I covered his annulled marriage to Helen Hysell in 1909 and the unnamed wife listed on his 1917 draft registration. For this third and final installment I will try to untangle some of the details of his marriages to his last 2 wives. On March 27th, 1919, shortly after leaving military service, Nelson married Genevieve Cover Finklestone in New York City. Genevieve was a divorcee and this was her second marriage. Interestingly, the marriage certificate indicates that this was Nelson's first marriage. So why did he list a wife on his draft registration two years earlier? At first I thought he may have lied in order to get out of serving, but that didn't seem to fit someone whose brother and grandfather both died in battle. The wife of 1917 was the same one he married in 1919! So, what to make of the 1919 marriage? No record of an earlier marriage between the two has yet surfaced, so one possibility is that they were not married but living together under the guise of man and wife. More likely, however, is that Genevieve's divorce from her first husband was not finalized as they thought and Nelson discovered this during his time in New York during the end of the war. That would explain two things. First, Genevieve's last name on the marriage certificate is her married name, Finklestone, not her maiden name, Cover. Second, the timing of the marriage. If Nelson discovered the divorce situation while in New York, where Genevieve had married her first husband in 1913, he probably asked (or probably demanded) that she come back east to take care of the divorce and then get (re)married. One question that remains unanswered is where did Nelson and Genevieve first meet? As she was living in New York City, it's most likely that it happened during one of his business trips to the city in 1914 when he was still working as a film exchange man. Perhaps it was their 'marriage' that prompted him to return to Los Angeles that year and begin a new career in photography. In any case, the 1919 marriage didn't last. The last record of them being together is the 1920 census; sometime between then and 1922, they divorced. Nelson's last wife was Rosalie Knight. The two were married on January 21st, 1922 at the Madison Ave Methodist Episcopal Church in Manhattan. A few weeks later, the couple set sail for a honeymoon in Eygpt, eventually returning the the States at the end of June. Sadly, this marriage ended just a few months later when Nelson died at the age of 33. After Nelson's death, Rosalie returned to New York, eventually remarrying in 1934. Her third and last husband was Carl Schraubstader, whose one claim to fame is writing the music to oft-recorded hit song "Last Night on the Back Porch" in 1923 while a student at Cornell University. Rosalie was 11 years Carl's senior, although she seems to have cut 12 years off her age on various records (when she married Nelson, she listed her age on the marriage certificate as 26, although she was actually 30). Rosalie and Carl remained married until her death in 1979. So there you have the history of Nelson Evans' marriages. Four weddings, three women, two wives. A man truly not lucky in love. Last week I attended my first Cinecon, the long-running movie convention held in Hollywood (this was the 51st one). While the main focus of the convention is the great films that are shown at the historic Egyptian Theatre, I was equally interested in the dealers rooms, with the hope of finding a few Evans photographs to add to my collection. Although there were far fewer dealers than one would find at the Cinevent convention here in Columbus, there was one who was selling vintage photos. Out of the dozens of Evans pictures they had, I purchased seven. Some I bought because they caught my eye, others because the actor was of interest. The first one I bought (I made 3 buying trips over the weekend) was this one of Louise Fazenda. I had been hoping to find a copy of this particular photo, so that's why I got it first. It most likely dates from 1917-18. Another full-body portrait I purchased was this one of Laura La Plante. This one dates from the beginning of her career when she was working for Christie Studio, again around 1917-18. For some forgotten reason, I had hoped to find a photo of Pauline Frederick. Perhaps it was because there's something timeless about her. In any case, of the two that I found, this is the one I came away with. 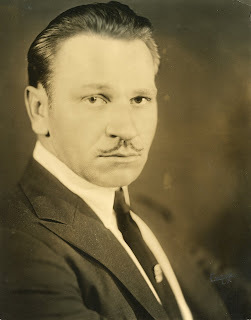 Wallace Beery was another one on my want list. Nothing fancy, but that's a great mustache. Although I wasn't looking for a photo of Wanda Hawley, it was those ubiquitous pine branches that won me over. They also appeared in photos of Marie Prevost, Mary Pickford, and Mary Miles Minter, among many others. The last two I bought for aesthetic reasons. Evans was at his best when he played with light. This striking photo of Gladys Brookwell seems to be lit with sunlight. 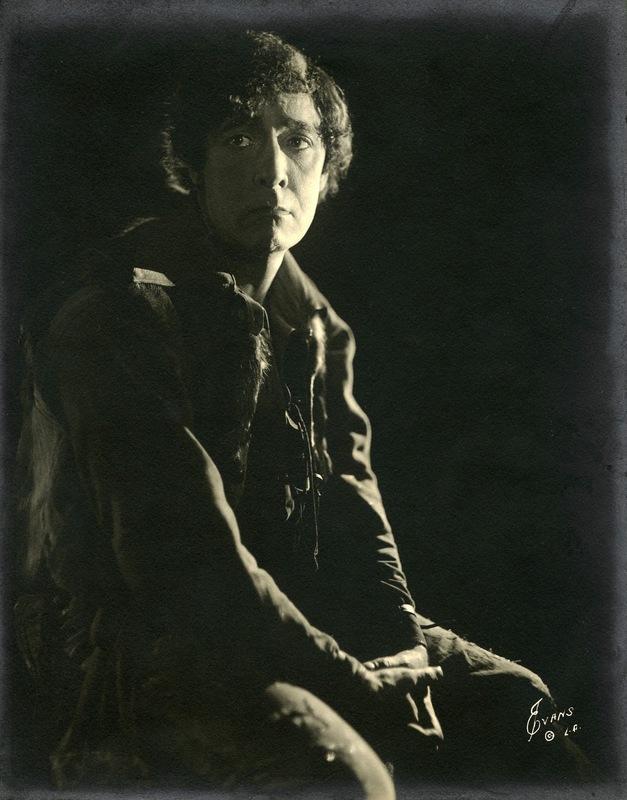 Finally, here is a photo of Monroe Salisbury in his costume for the movie The Barbarian. Just one light, but it works perfectly.